Yet another generational shift has arrived. For decades, understanding and reaching millennials has been a top priority for many brands and marketers—and now more than ever as the generation represents the majority of the American workforce. However, Gen Zers are on the rise, with the oldest members of the generation getting “big kid” jobs and kicking off their careers. For marketers, this not only means adapting digital marketing strategies, but also nurturing the marketers-in-the-making who have or will join their ranks. 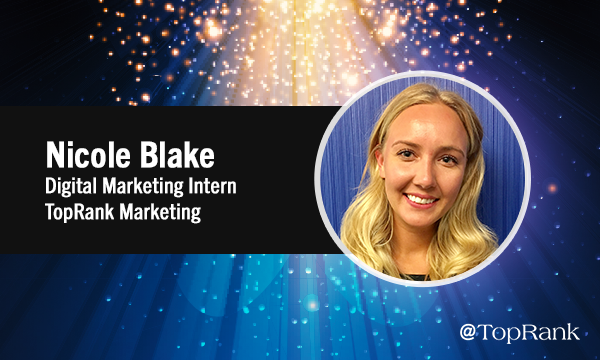 At TopRank Marketing, we’re lucky enough to have a budding marketer and Gen Zer, Nicole Blake, on our team for the summer as our first-ever Digital Marketing Intern. And in honor of National Intern Day on July 26, we want you to get to know her, what she’s learning, how she sees the digital marketing industry, and what she thinks the greatest opportunities to reach her generation are. Nicole grew up northwest of the Twin Cities in the Albertville-St. Michael area. “For you locals: Yes. I grew up like 5 minutes from the huge Albertville Outlets,” she quips. 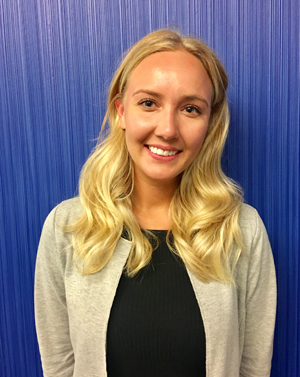 After graduating from high school, Nicole headed southwest of the cities to attend Minnesota State University, Mankato, where she’s pursuing a degree in Marketing, with minors in Mass Media and Business Administration. But enough with the basics. How about a fun fact? According to Nicole, she earned quite an ironic nickname as a kid that refuses to go away. In addition, Nicole is an avid traveler. For what it’s worth, when pressed on the matter, she chose waffles. But, of course, we’ll try to work breakfast education into her intern curriculum. Now more than halfway through her internship with us, Nicole says she’s encountered a few surprises with regards to the industry itself, as well as agency life. As for the industry, her sentiments are a good reminder that what we marketers do is nothing short of amazing — but if we’re going to reach our changing audience and train up our newbies, we need collaboration. As for agency life, Nicole says she’s been surprised by how … casual it is. These days, our entire lives are built around digital technologies So, it comes as no surprise that Nicole feels the best way to reach her generation is through digital means. “Marketing messages that are intended for the younger generations should be disseminated through digital channels and smart devices to both engage and create personalization,” she says. And building off the engagement and personalization piece, Nicole believes marketers need to strive to create an emotional connection with the younger generation. So, using humor or other emotion-evoking approaches are a must, in her opinion. When it comes to driving action, particularly when it comes to consumer products, make sure some of the tried-and-true value propositions are at the forefront of messaging. Thank you to Nicole for her insights and candidness — especially your public admission that breakfast (and all its delicious glory) isn’t your thing. We’re so glad we’ve had the opportunity to work with you, get to know you, and help you get started on your marketing journey. For all the seasoned marketers out there, be ready for the next generation of marketers to join your ranks. They want to get their hands dirty, they’re down to collaborate, and they can bring you some interesting insight on how to reach the “next” generation. Finally, to all the interns out there. Happy National Intern Day! Interested in joining the TopRank Marketing team? Take a gander at our open positions.